Carell plays Channing Tatum's wrestling coach in "Foxcatcher"
he Steve Carell in Bennett Miller’s new Foxcatcher doesn’t bear much resemblance to the one who peered out at us almost a decade ago from billboards for The 40-Year-Old Virgin, the actor’s breakthrough movie. 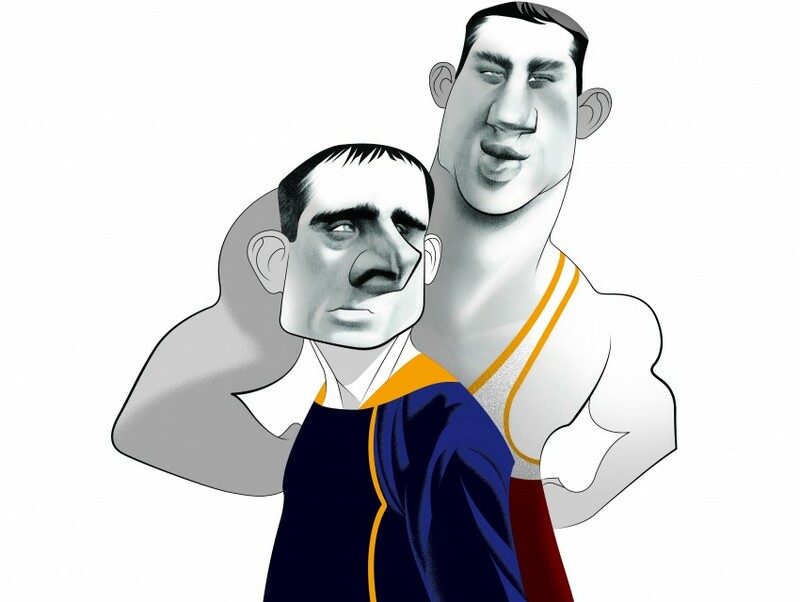 Though the two characters couldn’t seem more different, both are at least a little creepy and for the same reason: They’re regressive and unnaturally childlike, with Virgin’s Andy too wide-eyed and unknowing of the world’s ways for a middle-aged man, while Foxcatcher’s multimillionaire John du Pont is in the thrall of the unfulfilled, adolescent hero-fantasies with which he’s futilely tried to impress his mother, the only person with whom he has a bond. The biggest distinction between the two, of course, is that Andy makes us laugh, often and loudly; as an overgrown teenager, he wins the sympathy of the overgrown teenager in each of us. In contrast we titter ever more uneasily at Du Pont’s increasing strangeness, even as our disconcerted amusement accompanies a sense—regardless of whether we know the true story on which Foxcatcher is based—that something ominous is around the bend. For the role of Du Pont, Carell hasn’t just forsaken the broad humor of his goofy, comedic personality; he’s rewired that persona into a narcissism as lethal as it is absurd. Whereas before his roles felt fitted to an image he’s rarely abandoned, here the actor appears, for the first time, not to be Steve Carell at all. This movie season a lot of funny people have been going darker. 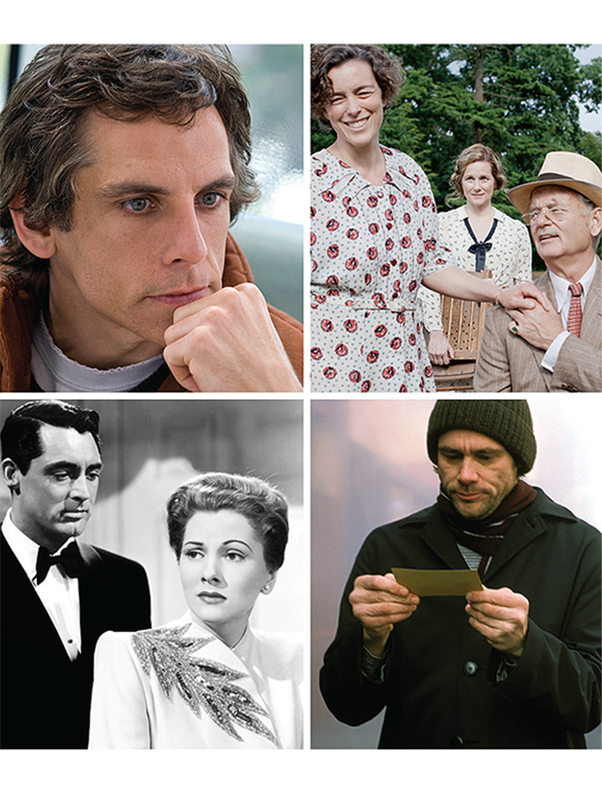 Most are doing it by degrees, such as in the case of While We’re Young’s Ben Stiller—picking up on the tentative metamorphosis of 2010’s Greenberg and last year’s The Secret Life of Walter Mitty—or in family stories like Tina Fey’s This Is Where I Leave You and Kristen Wiig and Bill Hader’s The Skeleton Twins. Some of the results are flat-out bipolar, such as Welcome to Me, Wiig’s controversial story of a psychologically disturbed woman who wins the lottery, in which the shift from funny to serious is abrupt (when the film can tell the two apart). Bill Murray in Saint Vincent is unifying the funny side with a seriousness he’s spent 30 years developing since his failed adaptation of Somerset Maugham’s philosophical meditation, The Razor’s Edge. Following his Franklin Roosevelt in Hyde Park on Hudson, Murray may now be more an example of dramatic sensibilities returning to the comedic. Chris Rock plays a comic trying to become a dramatic actor in the upcoming Top Five (which remains a comedy, not a drama), having fun with every comic’s paradoxical lament that nobody can take him seriously when he’s making people laugh all the time. While most actors understand that the comic actor is usually more adept at drama than the dramatic actor is at comedy, this is of little solace when comedic performances almost never get nominated for Academy Awards. “Why so serious?” Heath Ledger’s Joker asks in The Dark Knight, and the answer is that prestige and posterity, not to mention the commensurate paycheck, are no laughing matters. The attempt by an actor as associated with comedy as Carell to expand his repertoire is indicative of how the nature of stardom has changed: Stars always have been their own brands, to use the current vernacular, but in an age when few make a movie a hit, the brand has more value the more narrowly defined it is. Over the course of four years, starting in the late 1930s, Cary Grant became a star with a string of inspired screwball features, including Topper, The Awful Truth, Holiday, Bringing Up Baby, His Girl Friday, and The Philadelphia Story (mixed in with a couple of adventure dramas like Gunga Din and Only Angels Have Wings); these gave him the chance to both trade on and send up his own elegance and wit. Then, beginning with the melodrama Penny Serenade and the thriller Suspicion, on through the early ’60s, the roles assumed shadows that probably were calculated but felt organic. The goodwill Grant won as a comic actor came in handy in Notorious, where he’s an emotionally ruthless spy, and Charade, where he exchanges quips with Audrey Hepburn while still convincing us—for five minutes near the end, anyhow—that he’s a cold-blooded murderer who means to kill her. omething about our stars and something about our times preclude that goodwill, without which comic actors are less inclined to reveal their demons. In fairness this may not be the stars’ fault but ours. Next month or next year Will Ferrell might give a performance that tears our hearts out, but that isn’t what we hired him to do; however popular he may be, we aren’t so invested, as audiences were with Grant, to put up with Ferrell’s demons. Notwithstanding the virtues of The Truman Show and Eternal Sunshine of the Spotless Mind, the Jim Carrey of those movies never really took off with audiences. In a congenitally ironic age, few of our comic actors evoke a vulnerability that we’re willing to accept, and those who can, such as Louis C.K., don’t seem bothered with whether they’re perceived as funny or serious; the fourth season of Louie certainly didn’t seem very concerned with whether it was funny, which most of the time it wasn’t. Of these actors Murray has come closest, which is startling because his shtick was originally based on irony more than anybody’s. Sadly looming over any discussion of a comic actor’s demons is the memory of Robin Williams, who successfully made the transition to the dramatic with Dead Poets Society, Good Will Hunting, and especially Insomnia and One Hour Photo, which for all their bleakness still weren’t enough to exorcise his demons. Williams’s work may, on the other hand, have served as a template for Carell, whose John du Pont in Foxcatcher goes farther than any other current comic has. Socially inadequate, without family or true friends, Du Pont is pathetic in his vaingloriousness (he fancies himself a potential Olympic wrestling coach), barely comprehending that his every relationship is based not on affection but power, that his every opportunity is based not on what he’s earned but on what he’s been born into as the heir to a vast fortune. The origin of Carell’s performance lies back in that breakthrough year: Along with the stunted adolescence that The 40-Year-Old Virgin’s Andy has in common with Du Pont, and the suicidal impulses of Little Miss Sunshine’s gay French scholar, were the tortured employee interactions of his paper company manager in The Office. As with Du Pont, Michael Scott’s awkwardness and lack of social grace were rooted—affectations of empathy aside—in an utter disregard for anyone else. Carell seems at home in this emotional terrain, the terrain of the man who’s never at home anywhere, including his private estate with its helicopter pad and horse stables; more than funny or sad, Foxcatcher is tragic in a fashion that feels peculiarly American. Next he might consider playing Richard Nixon.